Menno Middeldorp and Oliver Wood. When the ECB announced an extension of its asset purchase programme on December 3 2015, the euro appreciated, bond yields rose and equity prices fell. This does not mean that the extension tightened monetary policy, but merely that it was smaller than what markets had priced in. In order to calculate the full impact of the programme on asset prices, we need to measure both the anticipation effect and announcement effect and add the two up. Our analysis suggests that the announcement effect undid about half of the anticipation effect, and so the extension of asset purchases still pushed down yields, supported equity valuations and depreciated the euro. However, compared to the initial programme, its impact on asset prices was smaller. In a previous post, we used the relative frequency of Bloomberg news about ECB QE to identify and measure the market’s anticipation of the ECB’s Public Sector Purchase Programme, which started in March 2015 (we’ll label it QE1). We constructed a time series based on the proportion of Bloomberg news articles containing the terms ‘QE’ or ‘quantitative easing’ along with ‘ECB’ (Chart 1) and included it as an explanatory variable in various asset price regressions. This involved regressing changes in asset prices on news flow and control variables and using the coefficients on the QE news variable to estimate the total effects of ECB QE on each asset price. The results indicated that there were statistically significant and economically meaningful effects from the anticipation of ECB QE across a variety of asset classes in both the euro area and UK. We estimate the anticipation effect of QE2 through the same method as in the previous post, by regressing asset price changes on news flow. Some judgement is required to identify which periods to include in the analysis. News flow after the implementation of the public purchase programme started on March 9th 2015 probably reflected news about ongoing purchases and their effect rather than the anticipation of a new or extended programme, which is what we are interested in identifying here. Consequently, we only use data from April 2014 to March 6th 2015 (before QE1) and from August 2015 until December 2nd 2015 (before QE2). For each asset price regression, we estimate one coefficient on the news flow variable, using data from these two anticipation periods together; but only after confirming formally, with Wald tests, that if we were to estimate coefficients for the two periods separately they would not be statistically significantly different from each other. Table 1 shows that all the coefficients, except the one for the gilt yield, are highly statistically significant. Multiplying the coefficients by the cumulative news flow gives us an estimate of the total anticipation effects of ECB QE1 and QE2 for each asset price, see Columns 2 and 3. See Very much anticipated: ECB QE had a big impact on asset prices, even before it was officially announced for details. Bond yield coefficients shown here are estimated according to “without OIS control” shown in Table 2 of the earlier blog. Estimates of total effects for QE1 differ because coefficients are re-estimated using data from both samples together. We estimate the announcement effect through a simple event study, by looking at intraday data around the time of the announcement. Markets were expecting both a deeper deposit rate cut (announced at 12:45 UK time) and a larger asset purchase extension (announced at the press conference which began at 13:30), than those which actually transpired. While we are only interested in estimating the effect of the purchase programme, it is likely that the first of these announcements affected expectations for the second, so we have two plausible windows for estimating the announcement effect: either the longer window that measures the total move in asset prices starting from the deposit cut announcement or the shorter window from the asset purchase extension announcement (see Columns 1 and 2 in Table 2). Event windows run from announcement of the statement (1) or the start of the press conference (2) until markets stabilized. So which time window is more appropriate? To provide some guidance in this we rescale all the estimates to a common denominator, i.e. impact per €100bn of purchases. Although the announced extension was clearly of a different size than the market participants expected, it doesn’t seem likely that the announcement instantly changed their assessment of the effect that a €100 bn worth of asset purchases has on asset prices. We would expect that impact to be the same for the anticipation effect and announcement effect. Rescaling can tell us which of the two event study estimates of the announcement effect is most consistent with the news flow estimates of the anticipation effect. It also helps us compare the strength of QE1 with that of QE2. We know that asset purchases announced between April 2014 and March 2015 (QE1) totalled €1157bn. In order to estimate the per €100bn effects of QE2, we need to make an assumption about what was priced into the market before the ECB announced the extension of €360bn. Based on polls and analyst reports, this was probably something like €650bn (for example, by increasing monthly purchases and extending them several months) so that the announcement was likely €290bn below market expectations. These numbers are used to give different estimates of the effect per €100bn of (expected) purchases, shown in Table 3. Column 3 and 4 show announcement effect estimates, per €100bn, based on the two event study windows. For either window, the scale of the announcement effect roughly line up with the anticipation effect for QE2 (Column 2), which provides independent cross-verification of both the news flow and event study approaches. Nevertheless, the anticipation estimates for the impact of QE2 on bond markets are more consistent with the shorter window (Column 4). For exchange rates and equities the longer window better matches the anticipation estimates (Column 3). Table 4 brings the results together. The anticipation effect (Column 1) is estimated using the news flow method. Then the event study estimate (Column 2) is used to incorporate the announcement effect. The net effect (Column 3) is our estimate of the total impact of QE2. The market reaction to the December QE announcement (Column 2) blunted some of the impact of the extension of the purchase programme. However, there was already a significant effect from QE priced into markets (Column 1). Our estimates suggest that roughly half of this was left after the announcement effect (Column 3). That means the effect of QE2 on asset prices was still notable, for example, we estimate the extension led to a 5% depreciation of the euro against the dollar anda 6% increase in equity prices. Nevertheless, the extension’s impact was still substantially less than the initial programme both because the extension was smaller and had less impact per €100bn of purchases. Menno Middeldorp and Oliver Wood work in the Bank’s Macro Financial Analysis Division. Next Post Houses: who has stopped buying them? QE is a short term event, adds to the Financial Bubble and in the end it does nothing for the real economy and real growth. 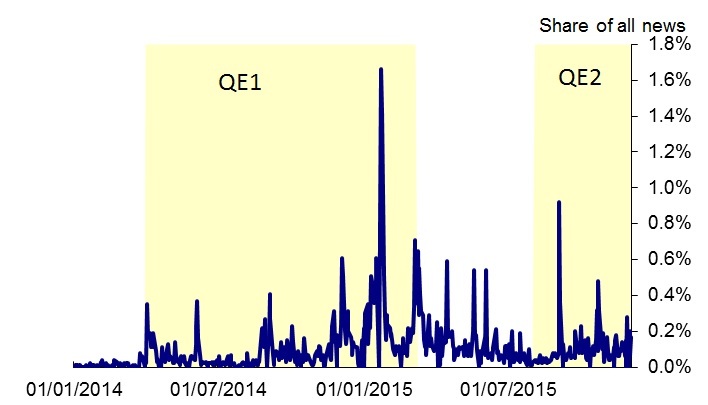 Each QE effect is shorter and shorter. What the Central Banks should do is address the Real issues and Correct/Address the problems of the financial system. This should have been done after 2003 and after 2008 but what they did is pump in more money and creating a larger Bubble vs taking corrective action. We are now on the verge of a major market crash across all asset classes and will be worse than 2008/9. Refer to former Bank of England Governor Mervyn King writings and comments along with others.